The West End Poetry Festival expands to four days in 2018, running October 17 through 20—Wednesday, Thursday, and Friday evenings and Saturday afternoon and evening. All events are free and open to the public. Wednesday, October 17 | starts at 6:30 pm | Johnny’s on West Main St.
Jaki Shelton Green, first African American woman to be North Carolina’s Poet Laureate. She holds numerous prestigious awards and honors which includes induction into the state’s Literary Hall of Fame in 2014, selection as the inaugural Piedmont Laureate in 2009, a 2007 Sam Ragan Award for Contributions to the Fine Arts of North Carolina, and a 2003 North Carolina Award. Lauren Moseley’s first book of poems, Big Windows, was published earlier this year by Carnegie Mellon University Press. Her poems have appeared in the anthologies Best New Poets and Women Write Resistance and in such magazines as FIELD, Narrative, Copper Nickel, West Branch Wired, and Pleiades. Lauren has been a fellow at Yaddo and the Virginia Center for the Creative Arts and a recipient of an artist’s grant from the Money for Women/Barbara Deming Memorial Fund. She lives in Durham, North Carolina. William Davis, former Poet Laureate of Hillsborough, is a spoken word artist who is dedicated to continuing the tradition of poetry in living form. Ambitious in his craft and performance, Endlesswill offers audiences unforgettable performances that evoke thought, introspection, and connection as a community. His 87 count poems in Broken Perception offers readers an assortment of remarkable poems that are as complex and multifaceted as the poet himself. 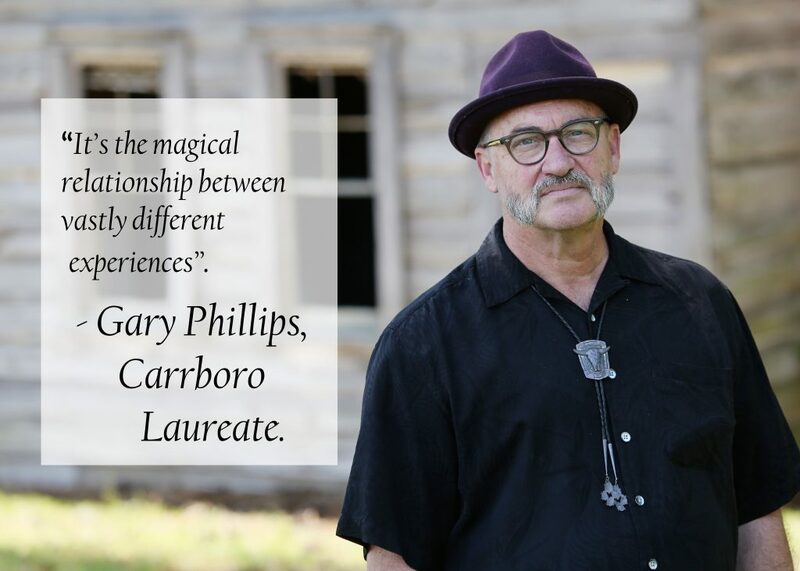 Gary Phillips is the 2016-2018 poet laureate of Carrboro, North Carolina. He is a writer, naturalist, and entrepreneur. Gary has a special expertise in conservation easements and the protection of significant natural areas. He lives in a rammed earth house in Silk Hope, North Carolina with his wife Ilana Dubester. Gary avidly reads anthropological science fiction, studies amphibian activities on full moon nights and was once chair of the Chatham County Board of Commissioners. His book of poetry and occasional pieces, The Boy The Brave Girls was printed in 2016 by Human Error Publishing (Wendell, Mass). Sandra Beasley opens the final day of celebrations with her work. Beasley is the author of several books, including Theories of Falling (2008), I was the Jukebox (2010), and Don’t kill the Birthday Girl: Tales from an Allergic Life(2011), and Count the waves (2015). This Virginia native also has a prodigious list of awards including the 2009 Barnard Women Poets Prize, 2009 Friends of Poetry Prize from the Poetry Foundation and the 2015 Cavafy Prize from Poetry International. Leading a workshop after reading her work, Sandra Beasley will share her knowledge with the public. Beasley received fellowships from the Sewanee Writers’ Conference, Virginia Center for the Creative Arts, and the University of Mississippi. This year’s festival will conclude with readings and conversation from three significant Arab women poets: Ruth Awad, Shadab Zeest Hasmi, and Fatima Abdullah. Come give these amazing poets a warm welcome!